Hawaiian Telcom has invested significant infrastructure that positions Hawaii for the future. 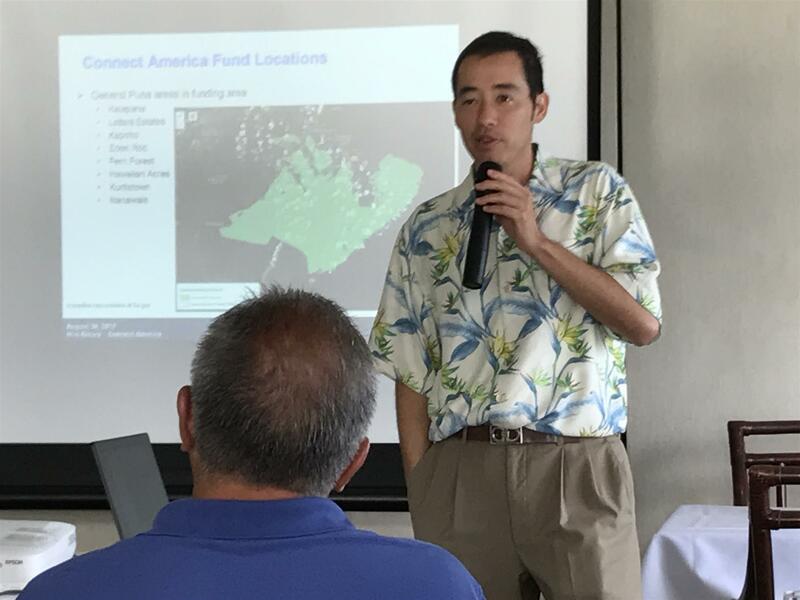 Bryan L. introduced Jason Thune, who explained the deployment of broadband fiber optics to serve the rural underserved areas of the Big Island and undersea cable projects connecting us to the mainland and beyond. Hawaiian Telcom is a technological company that strives to make people's lives better in business and daily life. To improve the daily lives of residents of the Big Island's vast underserved rural areas, Hawaiian Telcom received funding from the Connect America Fund. This is a federal program to expand fiber optic broadband to underserved areas as determined by FCC. The Big Island has received the lion's share of the funds with 70% of funds invested here. The areas that have been completed or in process include: Puna, Ocean View, Hamakua, North Kohala, Kaiwiki, Big Island County Club, and Ouli. Areas currently served by broadband should also see improvements by replacing the existing infrastructure with fiber optics. This upcoming investment is a result of the recent acquisition of Hawaiian Telcom by Cincinnati Bell, who is committed to investing more money in network upgrades and expansion. As recently reported in the Star Advertiser, Hawaiian Telcom has also invested in the installation of an undersea cable connecting Hawaii, mainland, and Asia. As a result, companies like Google are considering locating data centers in Honolulu. Hawaiian Telcom's network infrastructure includes firewall security for internet traffic coming and leaving Hawaii. Fiber optics is the great equalizer and future-proof. There is nothing on the horizon to beat it since it moves data at light speed.